This blog post was 11/16/10 written while on vacation in Aruba. This morning while walking on the beach in Aruba I saw the most magnificent rainbow. Walking on the beach is one of my favorite past times and my morning ritual when I'm here. I generally walk at least an hour each morning, stopping at the end of my walk to get my morning coffee, then enjoying it on the beach. Aside from the $2 for coffee and my condo key, I usually have my ipod in hand, listening to podcasts or favorite tunes. 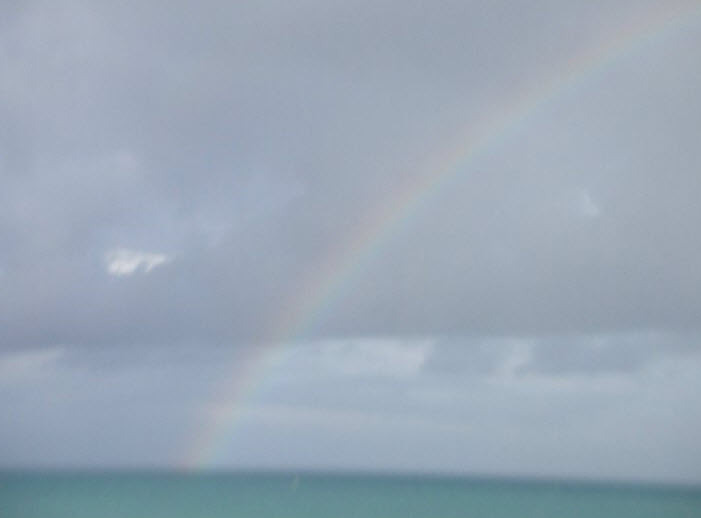 As I stepped on the beach today I saw a rainbow that took my breath away. My first though was "OMG how beautiful!" Which was followed immediately by "I wish I had my carmera or my phone to snap a picture. Should I go back and get it?" There I was, rather than taking total delight in the scene before me, I was wondering how I can capture it rather than just enjoying it. My grandmother was always the life of every party (many of you know her as Dolly). She was also obsessed with capturing it all on film and video tape. Smile for the camera. Hold that pose. And recreate the moment if necessary. And while I appreciate having those tangible memories now (although I didn't like posing so much back then) I wonder if she every really enjoyed the moment. The memory struck me as I stood and took in the perfection of the rainbow. In today's age of instant information where our lives are chronicled on Facebook and Twitter and our every action can be broadcast on You Tube, it's refreshing to stand in the sand, breath the salt air and enjoy a rainbow moment. Addendum Three days later I was taking a walk specifically to take some pictures of the scenery and find some interesting shots and lo and behold --- another rainbow!